We are planning hiking at the Nida Plateau and to the summit of Mount Ida in October. Which temperatures can we expect at day and night? Hi, no matter how experienced you are as a mountain climber or hiker, it is better to contact the locals and find out. We are not mountain climbers. The general weather in Crete has mild wet winters and hot dry summers. The height of Psiloritis, Mt Ida, means it receives snow in autumn and winter. The general weather service will show results from the Heraklion airport or cities on the north coast of Crete. The temperatures in the mountains can be very different, perhaps 15 degrees cooler, in the mountains compared to the coast. Conditions also vary from the coast to the mountains, it may be sunny on the coast and wet or windy on the mountain. 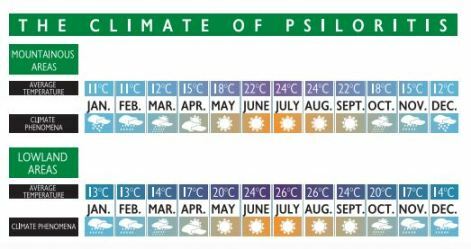 Here is the chart for Psiloritis climate across the year, it gives the average temperatures but does not give the overnight low temperatures which in October can be cold. The Nida Plateau and Psiloritis trail can be in snow at October, or not, it depends. There are many ways to climb to the summit of Mt Ida (2456m), the easiest trail is from Nida Plateau. From Heraklion, drive to Anogia, which is 40 km, the trip takes about an hour driving. Then take a smaller sealed road all the way up 24 km to Nida, leave an hour for this drive. Park near the taverna which is the only building on the plateau, so it is hard to miss, park in the car park which is the end of the road and the end of asphalt. Walk up the hill about 300 metres to the Ideon Andron – Ideon Cave or Zeus Cave. About halfway up is a little chapel with a garden and a few oak trees, named Church of Analipsi. This is devoted to those freedom fighters who took to the mountains to join in the resistance in Crete. Before reaching the cave, on your left you will notice the yellow and black E4 marker, this is the beginning of the trail to the summit of Mt Ida. The way is haphazardly marked by these yellow and black markers and some red dots painted on rocks. With such featureless country, it is best to know the trail, especially if it has been snowing. The country is sparse rocky heath vegetation with little or no cover. As it is unshaded, be very careful of sun exposure. Of course, in any season the conditions in the mountains can be changeable so be prepared with wind jackets etc. The trail is rocky and hard underfoot, but fairly mild in terms of difficulty. You need average fitness and good walking shoes. Of course, it would be best to be accompanied by a local, and take plenty of food and water. Buses leave Heraklion to Anogeia about 3 times a day, the trip takes about one hour and cost is under €4. There are no local buses from Anogeia to Nida, if you are an independent traveller this means you have to be a little more inventive in getting up there. Be wary because it is a dead end road, and gets really cold at night, so you could get caught out up there without chance of a return ride. There is nothing permanent up on Nida Plateau, just a building used in ski season, and some weekends, a small chapel which is locked and a very wet and very cold cave. Best to make some arrangements somehow, see contacts below. Always start this adventure early in the morning to allow for any mishaps or unexpected events. We were up there once, with friends, to visit the cave in October. It was very cold and desolate with patches of early snow. There was no one about, no goats or sheep to be seen. Just rocks and heath and more rocks and heath. One other tiny car came up the road. The taverna was cold, closed, half built and looked deserted. The chapel was closed and looked lonely. But not as lonely as a poor old donkey who had obviously been let loose to die up here in the cold. His desperate, pleading cries in a harrowing voice chilled us to the bone and brought tears to our eyes. We had no food for him and could not save him from this sad fate. We could only be glad that other donkeys now do not receive the same treatment, due to the volunteer work of ‘Walk with Donkeys’ and others. Psiloritis Natural Park has been included in the European Geoparks Network, and also in the Global Geoparks Network by UNESCO, as such there are some wonderful guides online that will give good information for visiting this area. The best reference book for this hike is The High Mountains of Crete by Loraine Wilson.